Barton Rovers lost out in a seven-goal thriller, beaten 5-2 at Thame United on Saturday. It had been a promising opening for the visitors as they led through Drew Phillips’ seventh minute strike after James Verney and Charlie Hayford were denied. However, Barton’s good play then evaporated as Thame wrested the initiative away from them and after seven good goalscoring opportunities went begging, levelled through Lynton Goss on the half hour. Rovers had to withstand a great deal of pressure, fortunate to go in at half-time level with their opponents. They were behind just three minutes into the second period though when Goss fired Thame ahead following some statuesque defending that allowed the striker to shoot past Matt Finlay. It was no surprise when Dan West fired in a beautiful free kick on 55 minutes and he made it 4-1 just three minutes later from close range. Lee Close then came off the bench, only to be dismissed within four minutes after arguing with the officials over a penalty awarded to United. 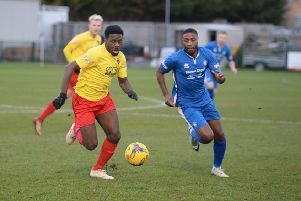 Goss made no mistake from the spot, although Rovers did have the final word, when Michael Gyasi went on a mazy run through the Thame defence and crashed home a brilliant right-foot shot from 25 yards for his second goal in as many games. Rovers are at home to Kempston Rovers this evening and travel to local rivals AFC Dunstable on Thursday. They also entertain Aylesbury on Saturday and then head to Cambridge City on Monday. Rovers: Finlay, Keating, Marsh-Brown, Alban-Jones, Andrews (C), Newton, Verney, Payne, Phillips, Hayford, Gyasi. Subs: Parsons, Walker, Close, Lincoln, Gould.